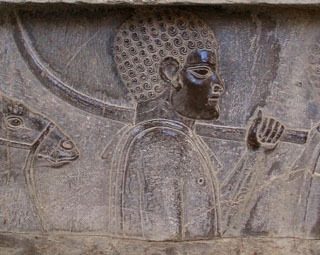 Cyrus was succeeded by his son, Cambyses (Kambujiya). There are no Persian sources for his reign we have to rely on Herodotus once again, although there are some Egyptian records which are interesting, and suggest a different interpretation. When Cyrus died, it was always going to be difficult for his successor to control so vast a territory. But the biggest problem facing Cambyses was Egypt. Egypt felt threatened by the Persian advance to the Mediterranean and the Pharaoh Amasis, allied to the Greek Polycrates of Samos, was looking to expand and had already grabbed the island of Cyprus. But the Persians managed to neutralise Polycrates, and occupy Cyprus. The Phoenicians, who had provided the navy for the Egyptians, also defected to the Persian side. 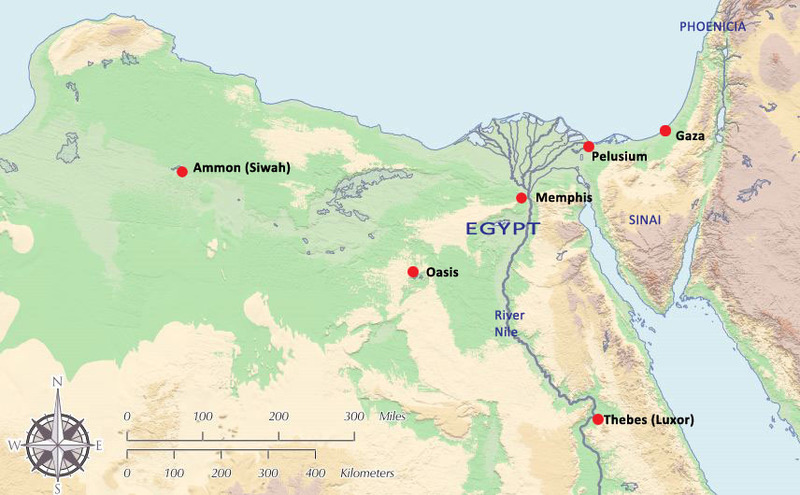 The Egyptians, under their new Pharaoh Psamtek III (Psammetichos or Psammenitus in Greek), son of Amasis, were on their own. The Great Chief of all foreign lands, Cambyses, came to Egypt, the foreign peoples of every foreign land being with him. He gained the majesty of this land in its entirety. They established themselves in it, and he was Great Ruler of Egypt and Great Chief of all foreign lands. His majesty assigned to me the office of chief physician. He made me live at his side as a friend and administrator of the palace. I caused his majesty to recognise the greatness of the temple of Neith-the-Great, the mother who bore Re and of all the gods and goddesses. I made a petition to the majesty of the King of Upper and Lower Egypt, Cambyses, about all the foreigners who dwelled in the temple of Neith, in order to have them expelled from it, so as to let the temple of Neith be in all its splendour, as it had been before. His Majesty commanded to expel all the foreigners who dwelled in the temple of Neith, to demolish all their houses and all their unclean things that were in the temple. 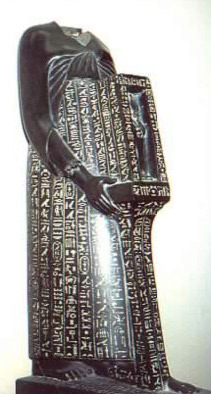 Cambyses, apparently, adopted the Egyptian titles, and was sympathetic to Egyptian religion. As you’d expect by now, though, the Greek story is far more exciting Cambyses in Herodotus is mad, cruel and disrespectful of everything Egyptian. But is this portrait true? The Persians marched across the desert [elsewhere Herodotus says it was a three-day journey] and took up their position [at the Pelusian mouth of the Nile] near the Egyptians to prepare to meet them in battle. Cambyses, having added Egypt to Persian territory, wanted more. He cancelled an attack on Carthage, but was eager to subdue “Ethiopia” (actually Nubia Sudan) and destroy the oracle of Ammon (which had refused to recognise him as pharaoh), in the desert to the west of Egypt. Cambyses finally turned back. But elsewhere (3.97) Herodotus does mention that Cambyses conquered the Ethiopians. And the appearance of Nubians, among other contingents from all parts of the Persian empire on the decoration at Persepolis, suggests that Herodotus was wrong about the failure of the Sudan expedition. They travelled with guides and reached the city of Oasis, a seven-day journey across the sand. Once they left Oasis, they marched across the desert towards Ammon, which they never reached. They stopped somewhere along the way, and while they were making breakfast a wind of extraordinary power started blowing from the south, burying them in sand so that the entire army disappeared. Thus arose one of the great mysteries of archaeology: what did happen to Cambyses’ lost army? In 2009 Italian archaeologists claimed to have found bronze weapons and human bones in the Sahara, which they thought could be their remains. But, as the incident is mentioned only by Herodotus, many historians doubt if it actually happened. Cambyses, according to Herodotus soon began showing further signs of insanity. He thought the people of Memphis were celebrating his military defeats in fact it was a festival in honour of the god Apis, reborn regularly in the form of a bull, which was then treated as a god, with a festival every year, and buried with great ceremony when it died. He stabbed the bull (he’d tried to kill it but missed) which later died. The festival was cancelled, and the priests were whipped he gave orders that any Egyptians caught celebrating were to be killed. According to the Egyptians, Cambyses went completely insane because of his crime, though he had not been in his right mind before either. Herodotus goes on to produce more extreme examples of Cambyses’ madness including the murder of members of his own family, and other Persians. But Herodotus sees the most telling evidence of his insanity in his blatant disrespecting of Egyptian customs especially their religion. Only a madman would treat such things as a laughing matter. Herodotus’ view of Cambyses was followed by most later writers but should we accept it? 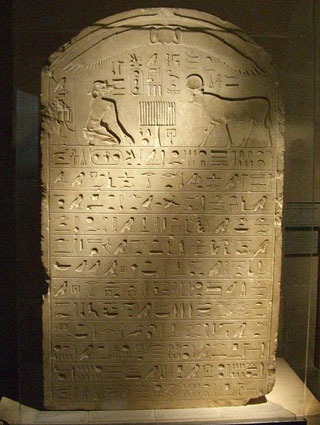 The Egyptian tombstone for Apis, the sacred bull, seems to praise Cambyses would it have done so if his behaviour was really as Herodotus describes? You must make you own mind up about Cambyses’ madness. Remember Herodotus was a Greek, and writing nearly a century later, when the people Herodotus spoke to in Egypt might well have grown to dislike Persian rule, and be ready to show Egypt’s conqueror in as bad a light as possible. Even more likely was it that Herodotus wanted make a strong contrast between the “good king” (Cyrus) and the “bad king” (Cambyses). But the basic fact is clear: Cambyses, carrying out the plan of his father Cyrus, conquered Egypt and added it to the territory the Persians controlled. No Egyptian was to rule an independent Egypt again until Gamal Abdul Nasser seized power from the British in 1952. Cambyses died in 522 BC in March and was succeeded by his younger brother Bardiya (called Smerdis by the Greeks). This is shown in independent evidence from Babylonian chronicles. But, even this simple fact is disputed and everything that happened around the time of the death of Cambyses is still today highly controversial. We can’t know what really went on: we can only try and work out what the most likely scenario was. Cambyses, Cyrus' son and successor gets a bad press from the Greeks, who portray him as a madman. However he won Egypt and seems to have ruled it successfully. Egyptian sources see him as a decent and just ruler. Herodotus has a fine story about him. He realised he was being so successful that the gods would be getting jealous. To give himself some bad luck, he had his prize possession - a ring - thrown into the sea. Not long afterwards, a fisherman caught a fish that was so large he decided to give it to Polycrates. When it was served for Polycrates' supper, the ring was found inside it. This caused Amasis to cancel his friendship with Polycrates, knowing that something bad was now bound to happen to him. This was a name given by Greeks to the Canaanites (Palestinians) living in cities along the coast of what's now Lebanon and Syria. They were a great sea-faring people, and planted colonies all around the Mediterranean (see Carthage, below) - and even travelled as far as Britain. They provided the ships and sailors for the Persian navy. Their greatest achievement was the invention of the alphabet, which, with a few later changes, is how you are managing to read this. More on Phoenicia. Originally a trading colony set up by the Phoenicians around 800 BC (above) in modern Tunisia. By this time (around 530 BC) it had become extremely rich and powerful, dominating the western Mediterranean, and trading along the Atlantic coasts. For several centuries, they prevented Greek expansion further west than Sicily. But eventually, led by Hannibal, an attempt to take on the Romans ended in its complete destruction in 146 BC. 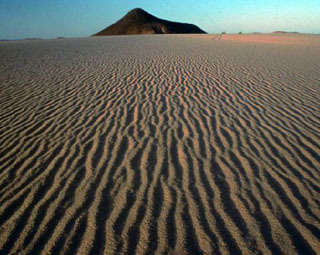 This was located at a vast, remote oasis in the Egyptian desert, now called Siwah, 560 km west of the Nile. There are plenty of remains still visible. Alexander of Macedon visited it.